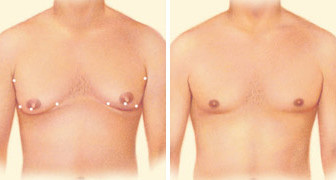 Men with gynecomastia (overdeveloped breasts) may benefit from male breast reduction surgery. 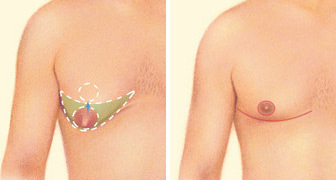 The procedure removes excess fat and/or glandular tissue and sometimes excess skin from the breasts so that the chest has a more masculine contour. The best candidates for surgery are men with firm elastic skin. Heavy users of alcohol, marijuana or anabolic steroids are generally not considered good candidates for surgery. These drugs may cause gynecomastia, so discontinuing their use may resolve the problem without the need for surgery. Likewise, overweight men may find that normalizing weight will reduce breast fullness. Breast reduction is usually accomplished by liposuction to remove excess fat or via open excision of excess glandular tissue. The procedure takes 1-2 hours and is generally done on an outpatient basis. It is usually done under general anesthesia..
Bruising, swelling, numbness, soreness and a burning sensation are common transient side effects after surgery. Discomfort usually subsides within a few days, but swelling and bruising may persist for three to six months. Some patients may need repeat procedures to remove additional tissue. The patient can return to work within three to seven days and resume more strenuous activities in 3-4 weeks. You should avoid exposing the operated area to the sun for at least six months to eliminate the risk of permanently altered skin pigmentation. Improvement is permanent, barring massive weight gain or use of certain drugs. Improvement is permanent, barring massive weight gain or use of certain drugs.